Timken ILS took the opportunity at the recent Hill Head show to Display some new and innovative products, one of which being our “Fully Controlled & Monitored Lubrication System”. The 2016 Hillhead show attracted over 18,000 visitors doubtless, the biggest Hillhead ever. 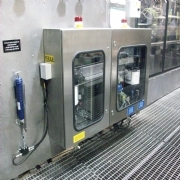 Intelligent CAN-BUS Controlled Monitoring System. High performance controller offering protected fuse and relay outputs, easy plug and play system with J1939 Protocol support. Dash Mounted Screen with LED operational Graphics. Easy to navigate interface with real time alarm functions, such as: No Grease Flow Low Pressure High Pressure Low Grease level Blown Fuse Pump Failure Control Valve Failure Real time monitoring is a function being requested now by the Industry as the importance of Good and Correct Lubrication of Key assets is of paramount importance. Please send me more information on Another successful show at Hill Head Buxton UK .